Matlock Town claimed a 2-1 victory in their final pre-season run out against local rivals Belper ahead of season opener next Sunday. Belper came the closest to breaking the deadlock midway through the first half as bruising forward Matt Harris shaved the outside of Phil Barnes’ goal with a smart curling finish from just inside the box. The Gladiators had an array on new blood on show in the final game of pre-season, most notable of which being Darnell Bayley-King. The summer signing from Rotherham impressed down the right hand side of midfield with his pace and skilful play forging several chances down the wing. Just minutes before the first 45 came to a close Matlock forward Shaun Harrad struck from just inside the 18-yard box to give the team in grey a 1-0 lead going into the break. Bayley-King continued his good work early in the second half as he carved out a glorious chance for goal scorer Harrad. 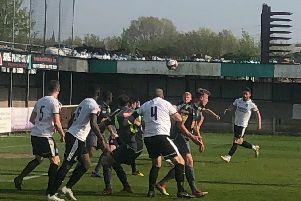 The winger played the ball in and with the whole of the goal to aim at Harrad fired straight at goalkeeper Scott Low, who beat the ball away. Dwayne Wiley was on hand to double Town’s advantage as the Nailers were caught napping from a cross and Wiley was there nod in Matlock’s second. When Belper were in possession they struggled to form any real chances, being limited to pot shots at goal by the strong Matlock back line. However the Matlock defence was broken with 15 minutes to go. After a scramble in the box Eric Graves clawed one back for the visitors. Belper had a couple of late chances and forced a double save from ‘keeper Barnes, but they couldn’t find enough to level the tie and the Gladiators ran out winners in the two teams’ annual pre-season clash. Matlock’s season gets underway next week when they face Stourbridge away from home on Sunday August 13th.